A member of the band, The SkyFisherman, (who is also a loyal C and C fan) told us that Tommy's daughter, Rae Dawn Chong, was at his band's gig in Vancouver last week. 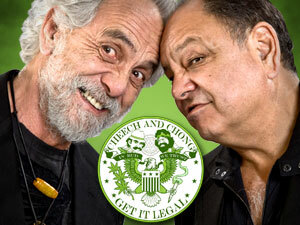 He also gave us a link to a very exclusive Tommy Chong interview conducted by a local college radio station. It's interesting. Also be sure to check out his band. Four-time Grammy winner Tommy Chong will host a benefit for ailing cult folk hero Jack Herer Sept. 22 at Universal Studios. A long-time L.A. resident, the 61-year-old Herer is recovering from a stroke. He was stricken July 15 while speaking onstage at the World Hemp Festival in Oregon. His speech and right side are still impaired, leaving him unable to work. He is expected to attend the benefit. Author of the 1985 underground bestseller "The Emperor Wears No Clothes," Herer is regarded as the father of the modern hemp movement. He has campaigned tirelessly over the last three decades to promote the environmental and medical benefits of the cannabis plant. Last year, High Times magazine named him its Man of the Century. Tommy will be co-headlining at Trump Plaza in Atlantic City , NJ tonight. If you're in the area, be sure to check it out. The Record newspaper quotes Tommy as saying a C and C reunion is highly unlikely. Richard "Cheech" Marin currently has two films in production. Both are set to be released in 2001. The first film, Spy Kids, starring Antonio Banderas, is about kids who have to save their secret agent parents. The second film, The Colored Star, stars Trey Parker, Eric Stuart and Charlie Sheen. We will provide more information as it becomes available.